Bling's the thing with sparkly rhinestones for the classy look! Choose from three new attachment options. 6 Rhinestone colors available. 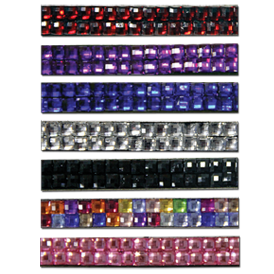 Choice of Pink, Red, Purple, Blue, Clear or Black Rhinestones. LY-3138 includes a split ring attachment with lobster clip. 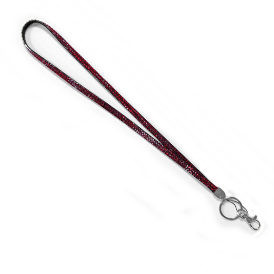 LY-3238 includes a round metal charm with full color printing and an epoxy dome that hangs from the bottom of the lanyard. Bull Dog clip standard. Other clip options are available. 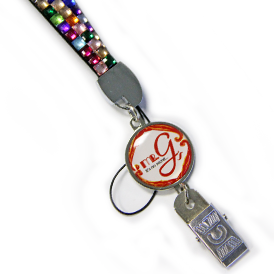 LY-3338 includes a Silver Metallic retractable with vinyl clip. 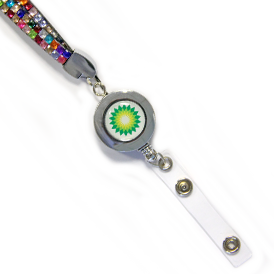 Full color printed logo on retractable with epoxy dome. A $60.00(g) sample charge will be refunded when an order is placed. Design changes will incur an additional charge. Overnight shipping charges apply. Adds 2 weeks to delivery. 4 weeks after artwork or pre pro sample approval.